Joel is a legend in the classic gaming community, having been featured in the infamous 1982 LIFE magazine photo spread featuring video game superstars. The former record holder for Berzerk has been featured in numerous news articles and in the 2007 documentary feature film, Chasing Ghosts: Beyond the Arcade which was screened at the Sundance Film Festival. This marks Joels 3rd appearance at the Southern-Fried Gameroom Expo on behalf of the Walter Day Trading Card Project. Joel West “JDW” 1st player verified to have 2, 3, 4 & 5 TG records all at once. 1st player to have both arcade and pinball records at once. Most active player still competing from 1982 Life Magazine Photo. Known for movies with starring credits: Chasing Ghost: Beyond the Arcade, (of Sundance Film Festival), King of Arcades, plus 3 others minor appearances in other movies. 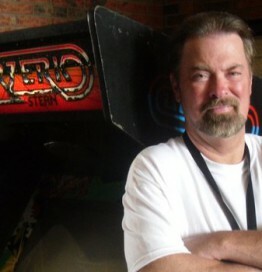 Known for Games: Battlezone, Rally-X, Frenzy, Pole Position I & II, PropCycle, Berzerk (Fast Bullets) & (Slow Bullets), Rocky (Pinball). Member of Committee/name on Ottumwa “Birth of eSports” Plaque. Taught 4 other gamers who achieved Arcade World Records.